So, Easter is now over and you (may) have piles of candy left. Let’s be honest… you probably don’t. But, imagine that you do. Maybe a few extra Homemade Peeps that you made last week after our post? If, like me, you have zero candy left (and only an upset stomach left to show), take advantage of the post-holiday candy sales and buy some! 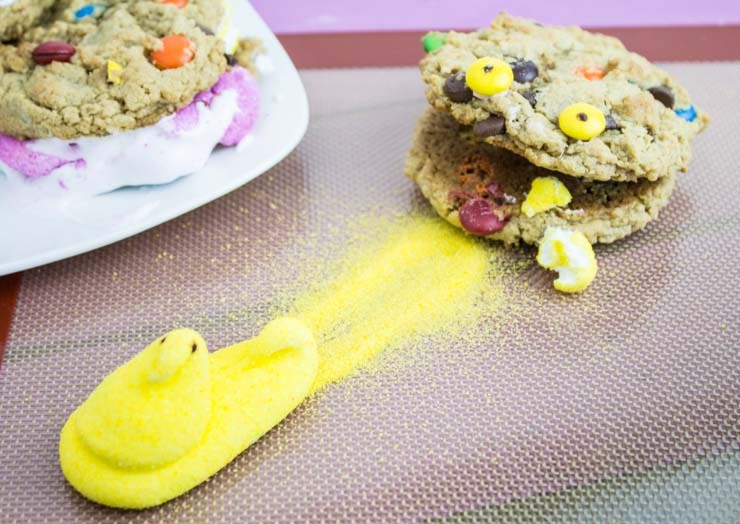 This recipe for Monster Peep Cookie Sandwiches is the perfect way to use it! One of my favorite cookies growing up are these enormous Monster Cookies. 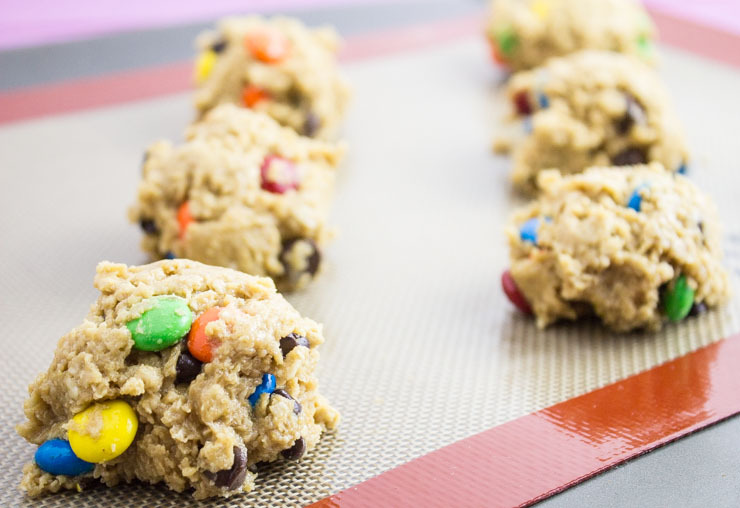 Zero flour in the recipe– only creamy peanut butter, candy and dreams. They are so soft and sweet. The perfect canvas for our extra candy and marshmallow treats. The cookies are incredibly simple to make. 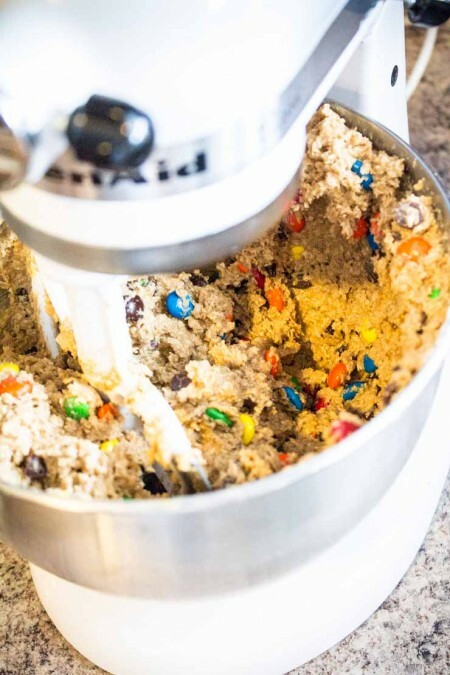 Toss everything in the mixer and you are done. Scoop out ice cream scoop size portions of the dough (because.. why not?! ), bake and cool. Gather all of those extra Homemade Peeps from their sugar-coated pond and set the to the side. Things are about to get tasty. 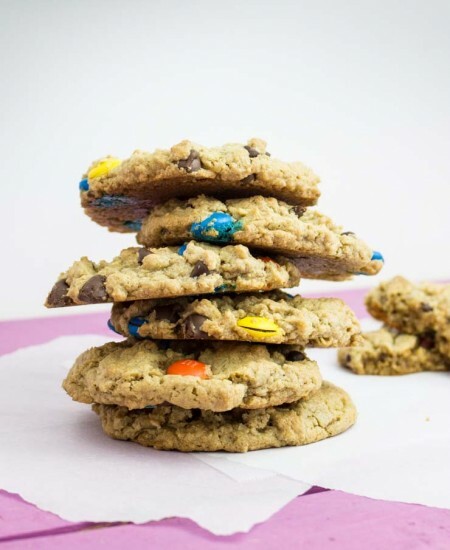 You could really mix in any candy pieces that you have around for these cookies. I’ve made them with Reese’s Pieces, M&Ms and even Andes Mints (a favorite of mine!). All were delicious. I don’t think it’s really possible to mess up a peanut butter, oatmeal and candy cookie. Let the cookies cool on your racks before you get ready to transform them into your new favorite cookie sandwiches. Have a drink. Take a Xanax. It’s only going to get better from here! 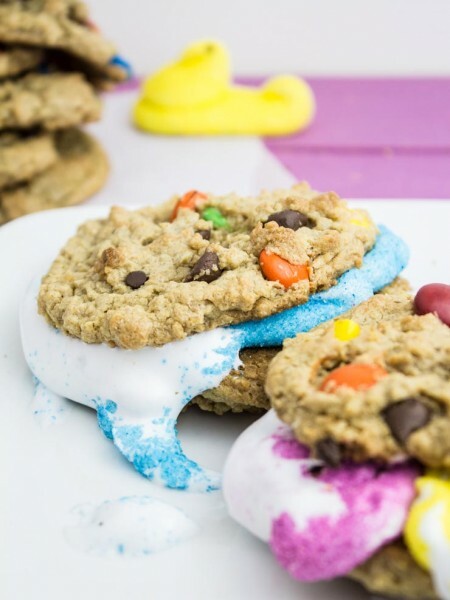 Toss a couple of your favorite color-sugar coated Peeps and place them on top of one of the chewy, candy-covered cookies. Microwave that sucker for juuuuust a few seconds and immediately place a second (yes… that’s what I said) cookie on top. Squuuuish them together and enjoy! The textured sugar that coats the Peeps combined with the creamy peanut butter base of the cookies is delicious together! 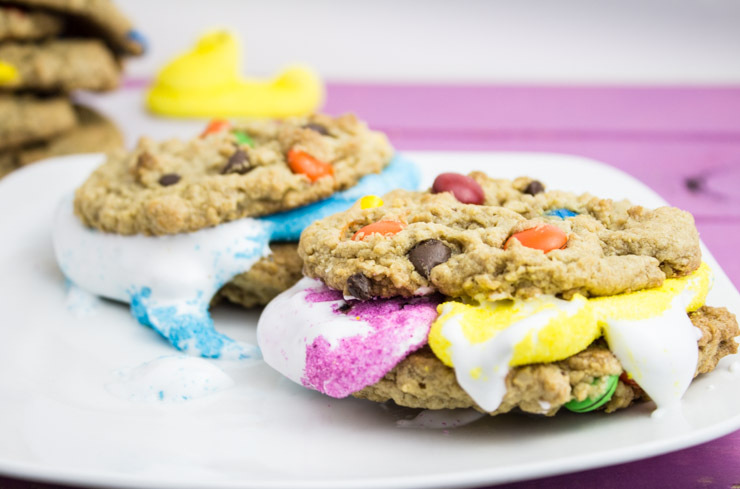 Monster Cookie Peep Cream Sandwiches! Combine butter, brown and white sugar in mixing bowl and cream for ~ 2 minutes. Slowly add each egg and mix until combined. Add remaining ingredients (except candy/chocolate chips) and mix until combined. Add candy/chocolate chips and stir well. Scoop ice cream size scoops of batter onto baking mat or paper-lined cookie sheet. Bake for 10-15 minutes until firm. Don't let them get too over-done or they wont stay as soft. Place one cookie upside down on microwave-safe plate. Place two peeps on top. Microwave for 5-6 seconds. Remove. Immediately place second cookie on top. ENJOY! 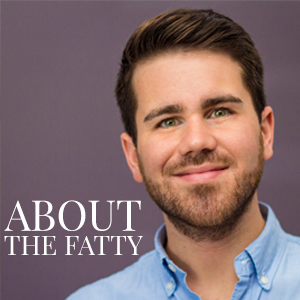 Visit SouthernFATTY.com and let us know how they taste. How do you use your leftover holiday candy? Let us know below! It’s actually a bit embarrassing how much that first photo made me laugh. These look like a midnight baking spree waiting to happen. Oh gosh, sugar coma come to mama! I love that pic of the monster cookie chasing the peep! I’m not a fan of peeps, but I’d sure eat one squished between two monster cookies.